An oscilloscope is an instrument to display signal voltages, plotted against time (Yt) or against another signal voltage (XY). A benefit of graphically showing signals is that oscilloscopes will show what is actually happening. The precise shape of the signal and time relations in the signal or between signals can be seen. Oscilloscopes displays electrical signals, but with the proper sensors, other quantities like temperature, movement, etc. can be measured as well. A scope has many applications, in many different areas. An important application of oscilloscopes is to troubleshoot circuits that do not function properly. Another possible application is using the lab scope as signal monitor when adjusting a circuit under test. 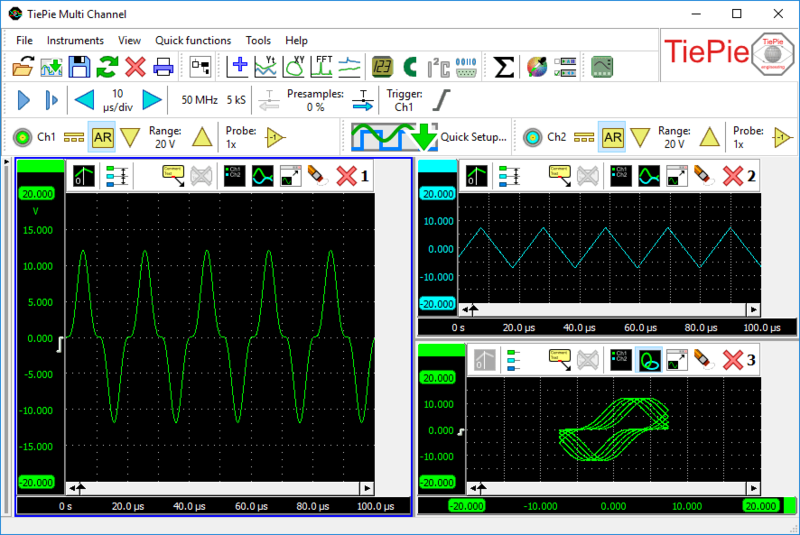 The oscilloscope can have one or more graphs, each displaying one or more signals, where each graph can display different parts of a signal. Graphs can display the signal(s) in Yt mode or in XY mode, with or without interpolation. Colors of all items in a graph can be set to any required value. Graph dimensions can be adjusted to any required size, graphs can be located in one single window or in separate windows, which can be located anywhere on the desktop. An instrument toolbar and channel toolbars are available for each detected instrument. The convenient toolbars provide clear buttons for all settings of the instrument and its channels. They show the current settings of the instrument and allow to change all settings. The large buttons are very suitable for touchscreen operation. These operations can be combined in any thinkable way. The result of a mathematical operation can be displayed in a graph and can also be used as input for another mathematical operation. Controlling the oscilloscope is done through customizable toolbars, through popup menus and by hotkeys. A quick function toolbar is available for often used functions.